Halo E Liquid, the celebrated American E Liquid. 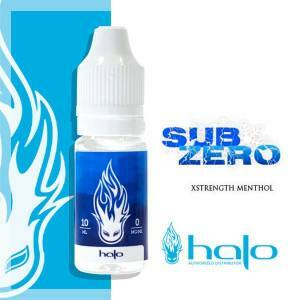 Halo, one of the most well known American Brands, propose an all in one range of E Liquids for the Electronic Cigarette. Complex and insolite, the Halo E Liquids have pleased vapers for many years with products such as Kingle's Curse Halo for Minty Flavours, Malibu Halo for Fruity Flavours and for the most famous Classic, Tribeca Halo, Longhorn, Prime 15 and many others. The Halo E Liquids have a composition of 55% / 45% in PG/VG and 30% / 70% PG/VG for the HIGH VG Range. Looking to purchase an E Liquid? Consult our selection of Halo Range, Mint, Pina Colada, Strudel, Coffe Mocha... by revisiting these cocktail or pastry recipes from all over the world, the brand will seduce the tastebuds of numerous vapers. The figures prove this: Material of sale, the Halo E Liquids are amongst the leaders on the market of the Electronic Cigarette. The different gourmet flavours, invented and confectioned by the brand are one of the factors which puch vapers to buy E Liquids. Another reason is the quality. The E Liquid is entirely manufactured in the United States of America. Halo will always be there 100% nto satisy the purchase of the E Liquid. If you are not sure to appreciate the purchase of Halo E Liquids, you can always try the Halo Pack Test. It will allow you to discover the brand of E Liquids, the different flavours and you will then decide.